Want to take part in a project and help our students learn about teaching in Hawaii? Contact us! 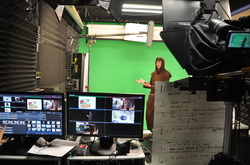 Have a short lesson you would like to capture in our Video Studio Classroom? You bring the content we will provide the cameras, lighting, and microphones. We want you to show off so our future teachers can learn from your hard work. Not only will you get a finished edited copy of your lesson, there is a gift card in it for you too! Contact us for more details.